One of the biggest new in the new VMware vSphere 6.0 suite are probably Virtual Volumes, fundamental part of the VMware’s SDS vision. 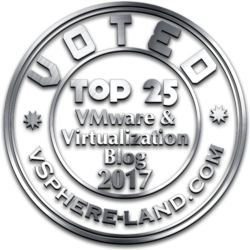 What are vSphere Virtual Volumes (or VVols)? They are an integration and management framework to convert external storage in VM-aware storage. From my point of view is the biggest news of this release (and probably the most announced, during the previous VMworld… first tech preview was in 2012!) 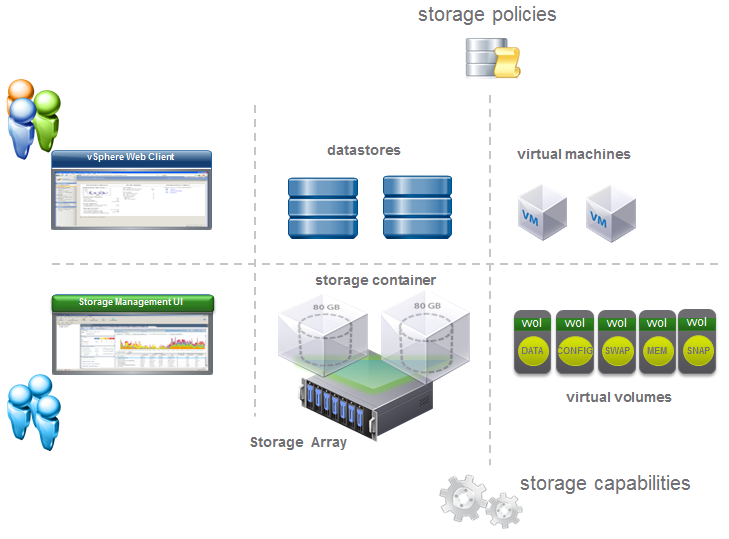 and can really change the storage part of a virtualized design, included how it’s design. For sure is a good deal both for VMware and storage vendors and demonstrate that VMware does not necessary replace storage functions or make them dummy. Yes, it can provide several interesting functions, but storage side features are still important! But also note that storage vendors can implement different features in different way, so does not just have a look at the different check-list but learn more on each different solutions (and read also this post). 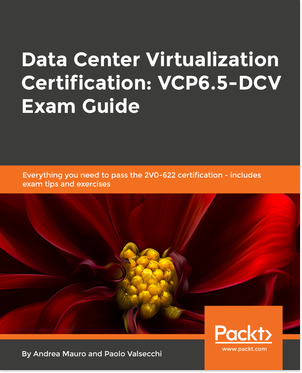 Using VVols you can avoid the complexity of block based storage related to LUN creation, LUN mapping (or masking), LUN sizing, … Each virtual disk could be natively represented on arrays and it will support existing storage I/O protocols (FC, iSCSI, NFS). 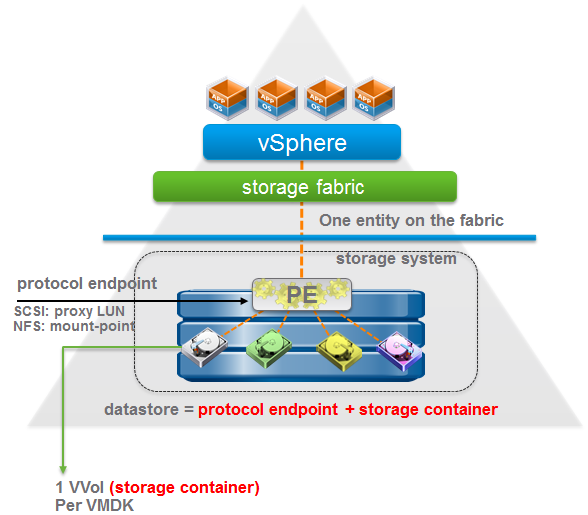 In this way VVols enable VM granular storage operations using array-based data services, but also will extend vSphere Storage Policy-Based to storage ecosystem in order to have a “unified” SDS approach all VM-centric and policy driven. Or can make virtualization admin completely autonomous on storage provisioning (after that VVols have been configured). Much important, it can virtualize both SAN and NAS devices making then like an object storage (where the objects are the VM files) and it’s included with vSphere (from the Standard edition!). To better understand each new term and part of this technology let’s analyze each of them. The Vendor Provider part it’s a software component (usually a plug-in) developed by Storage Array Vendors. This plug-in uses a set of out-of-band management APIs. The VP is able to export storage array capabilities and present them to vSphere through the VASA (2.0) APIs. Note that a VASA Provider can be implemented within the array’s management server or directly on storage firmware, but this depend by the storage vendor. Add a new Vendor Provider it’s like add a VASA 1.0 provider and a single VASA Provider can manager multiple arrays. Protocol Endpoints are a transport mechanism or access points that enables communication between ESXi hosts and storage array systems. They are part of the physical storage fabric, and they establish a data path on demand from VMs to their respective virtual volumes and they must be created by storage admins. PEs no longer stores VMDKs but it only becomes the access point. Storage containers are equivalent to datastores in a sense, but they are focused around the allocation of chunks of physical storage. 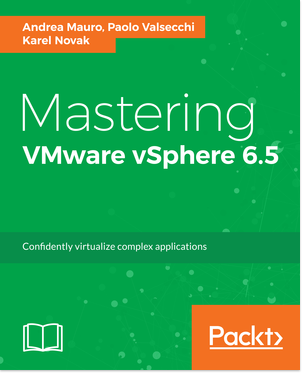 It’s a logical storage constructs for grouping of virtual volumes based on the grouping of VMDKs onto which application specific SLAs are translated to capabilities through the VASA APIs. Again, like Protocol Endpoints, a Storage Container must be created by storage admins. A single Storage Container can be simultaneously accessed via multiple Protocol Endpoints. And also VM snapshot can really change! Rebind – provides the ability to change the I/O channel (PE) for a given virtual volumes run time using events. 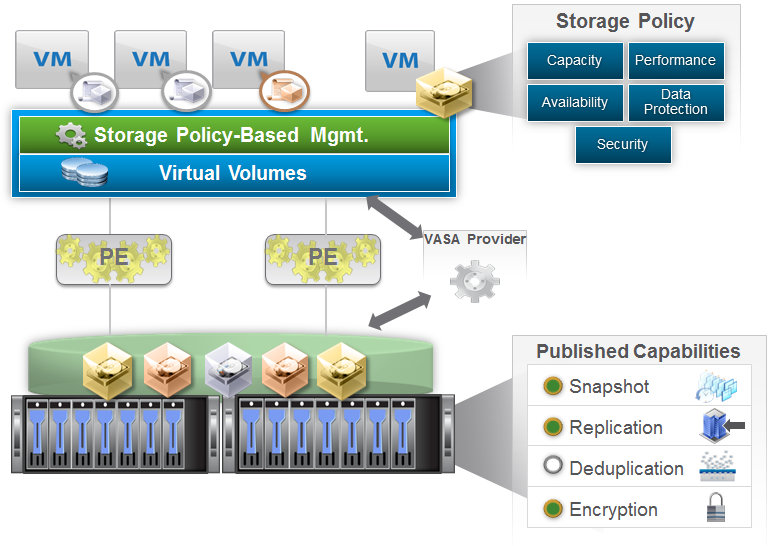 Like other VMware technologies (for example Virtual SAN) all can be defined by storage policy at VMs level. VM policies are a component of the vSphere Storage Policy-based management framework (SPBM) and can match storage array capabilities. Storage array capabilites are array based features and data services specifications that capture storage requirements that can be satisfied by a storage arrays advertised as capabilities. Storage capabilities define what an array can offer to storage containers as opposed to what the VM requires. Certain offloading operation will be done via VASA and other will be done using the standard protocol commands. For more information see those posts: Virtual Volumes (VVols) vSphere APIs & Cloning Operation Scenarios and vSphere Virtual Volumes Interoperability: VAAI APIs vs VVOLs.